How cool is it to have a book series called Butterfly House, and to be able to show the metamorphosis of a book cover… just like a butterfly! If you scroll through the photos, you’ll see the unveiling of my latest Butterfly House cover, version by version, once again designed by the ever-talented Kerry Sibly. Version 1: Kerry started with pink in the background, like my original Butterfly House Who Killed The Bride? … but I want something different from pink, so the first alteration was easy. Version 2: Right from the get-go I love this purple through gold. The Butterfly House Book 2 line on cover and spine are hard to read… they need to be white… and there is a lot going on with ‘Marilyn figure’ ‘actor bloke’ ‘cow’ and ‘camera’… I’m thinking, we need to simplify. Let’s make ‘Marilyn’ bigger and lose the bloke. Version 3: Now we’re cooking with gas! I’m loving this… but because it’s ‘movie star’ I’d like to see some twinkle twinkle little stars on there… stay tuned! Version 4: Ask for stars and ye shall receive!!! Version 5: More stars! Too many? Version 6: Subtle stars… I’m loving this! Now we’ve just got the back cover blurb to update and a new barcode to add, and we’re done. Here’s our Beautiful new Butterfly! Love your work, Kerry Sibly! Sharing a quick video about my hometown – Cowaramup in the south west of Western Australia. After lots of consultation with local dairy farmers and representatives of various local groups and committees, I put fingers to keyboard to help write our town’s submission. In autumn this year, we got the great news that Cowaramup had won the title of West Australian ‘dairy capital’, and would now go on to represent WA in the national competition with the winner announced later this year. The State nomination and winner’s announcement all happened right before the Deja-Moo 2017 (a huge weekend of cow-themed fun in Cowaramup), and the team from Dairy Australia came to visit our town during the mid-year school holidays and festival. I can only imagine what those Dairy Australia representatives must have thought – landing in the midst of a cold winter weekend of Cow Onesie frenzy! I feel so chuffed to have written a book set in Cowaramup, involving the increasingly famous Cowaramup Cows. 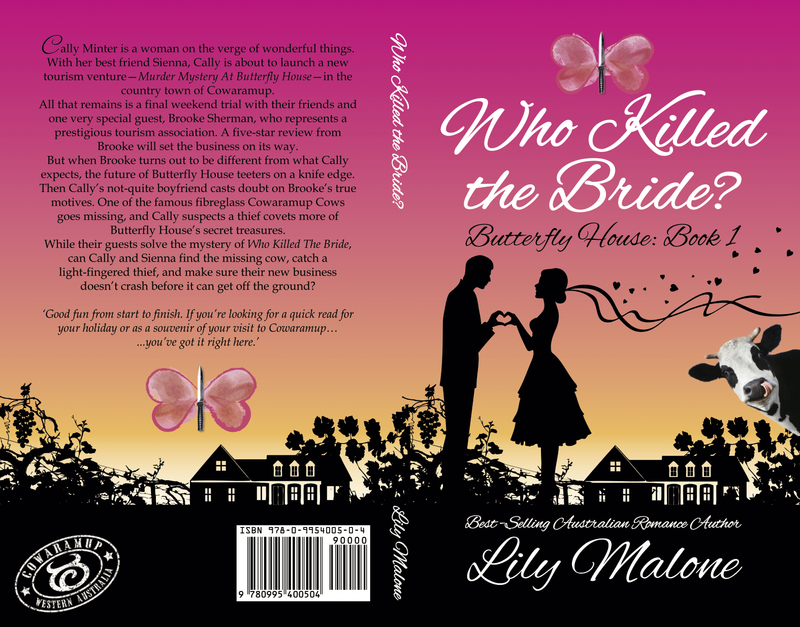 One of the speakers in the video is Kerry Sibly (you see him wearing the cow horns in his cow onesie chatting during the vid); Kerry designed the awesome book cover for Butterfly House Book 1, Who Killed The Bride?